HomeAway, one of the largest vacation rental sites in the world (owned by Expedia, with over 2 million unique places to stay), is offering a $250 bonus as an incentive to anyone who lists their property on the HomeAway website for the first time. What this means for someone in Regina who lists their property on HomeAway is that they can help pay for their next vacation (or mortgage) by renting out their apartment, house, or vacation home. In particular, renting out your property in the high demand seasons of spring & summer, or around holiday dates and popular events, is a great way to earn extra income. 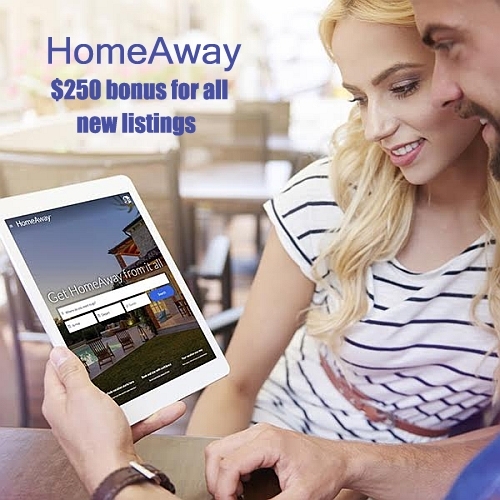 On top of the income that you would earn for renting out the property, HomeAway is offering a $250 bonus incentive, for all first time listings. How much can I earn by listing my property on HomeAway? To come up with an estimate of how much a person can potentially earn by listing their property on HomeAway, I performed a search on random dates in various months. When you click on the HomeAway price filter, it pops up with a bar graph that shows the relative number of listings for each price level, which makes it easy to estimate how much a property in the Regina area would earn. In the Regina area, most properties earn approximately $700 per week. To receive the $250 bonus from HomeAway, the property you list does not have to be in the Regina area. It can be located anywhere in Canada or the United States, but it must be a first time listing. IMPORTANT: You *must* create your property listing by going to the link above, in order for HomeAway to correctly track your new listing for this offer. If you do not, they will not be able to send you the $250 bonus. 2. Go through the steps of creating a listing for your apartment, house, vacation home, etc. 3. Receive a $250 bonus from HomeAway after a traveler completes their stay at your property. - This must be the first time your property has ever been listed on HomeAway. - Your property must be somewhere in Canada or the United States. - Your property listing must (a) accept at least 1 booking between April 16 and August 31, 2018, with a minimum booking value of $100 CAD, and (b) the traveler must complete that booking during the same time-frame. - You will receive a $250 CAD Visa Gift Card from HomeAway by e-mail. You can expect to receive your reward within forty-five (45) days of the date your traveler completes the booking. After that, you will have three (3) months to activate your card. Cards expire six (6) months after activation. There is a limit of one (1) reward per property. - Use the income from your property to pay for your next vacation, your mortgage, or a creative passion. - Maintain Control: You’re always in control of your listing. Only you determine pricing, availability, and who stays at your property. - Peace of Mind: You're covered by $1M Liability Insurance for all bookings made through HomeAway. Regina to Phoenix, Arizona - $227 CAD roundtrip | non-stop flights, new record! regina, yqr, offers and homeaway.